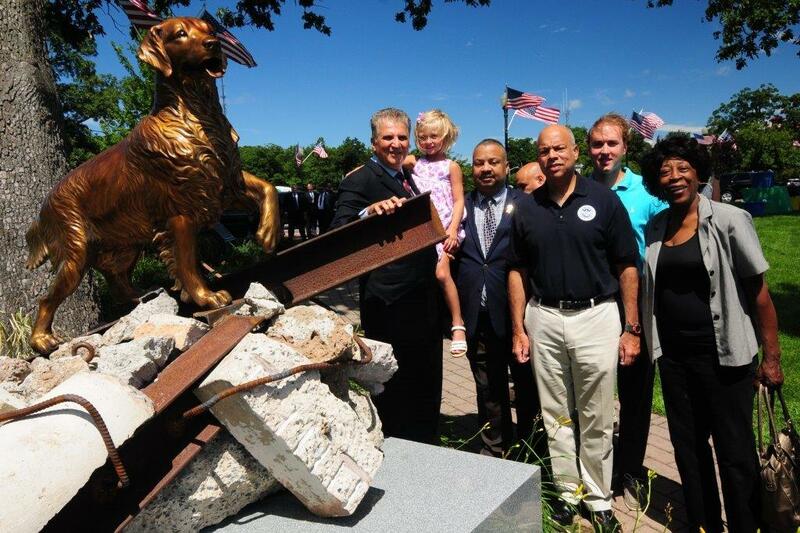 West Orange, NJ – Essex County Executive Joseph N. DiVincenzo, Jr. was joined by Homeland Security Director Jeh Johnson and New Jersey Attorney General Christopher S. Porrino at the dedication of the Essex County Search and Rescue Dog Statue at the Essex County Eagle Rock September 11th Memorial in West Orange. The statue commemorates the role that dogs had in the search and recovery efforts at the World Trade Center and Pentagon after the 9/11 attacks. “We can never forget the devastation and destruction that occurred during the attacks on September 11, 2001. Expanding our 9/11 Memorial is our way of recognizing the many lives that were lost, the futures of so many that were changed and the different segments of public safety that came to help,” DiVincenzo said. “In our lives, dogs become part of our family, are trusted friends and played an integral role in the rescue and recovery efforts at Ground Zero and the Pentagon. This statue will ensure their contributions during that ordeal are always remembered,” he added. “Today we pay tribute to the roughly 350 search and rescue dogs that worked tireless hours trying to locate survivors amid the twisted pile of steel beams, concrete and ash where the World Trade Center once stood, in addition to the Pentagon,” Porrino said. “During those harrowing efforts, various handlers stated they were so grateful to have a canine partner just to help them get through it,” he added. The bronze Canine Statue is about 4 feet tall. The base of the statue on which the dog stands is designed to resemble the rubble at Ground Zero. The statue and the base, which weigh about 5,000 pounds, sit on a one-foot tall block of granite. Sculptor Jay Warren from Oregon designed the Canine Statue. Warren also has worked with Essex County to design statues of Governor Brendan Byrne, Congressman Donald Payne, Rosa Parks, Sgt. Jorge Oliveira and Justice William Brennan at the Essex County Hall of Records Complex in Newark and the Althea Gibson Statue in Essex County Branch Brook Park in Newark. Artist Harry Gordon from Lambertville designed the base. The statue and installation was funded through corporate contributions from The Berger Organization, Community Education Centers, Covanta Energy, Horizon Blue Cross Blue Shield of NJ, Laborers’ Local 472 and Verizon. “The space honors the fallen and brave, and now it recognized the role dogs had in the aftermath of 9/11. Once again, the County Executive has displayed incredible vision,” Congressman Donald Payne, Jr. said. “This place is where family members and friends can find solace, and where we all can celebrate the lives and legacies of those lost that day. Today we are adding another dimension that highlights the bond and support that humans have with dogs,” NJ State Senator and Deputy Chief of Staff Teresa Ruiz said. “Dogs can be very humanizing for people when we stop and recognize their contributions,” Prosecutor Carolyn Murray said. “Putting a statue in their honor helps us remember that we are not alone on this Earth,” she added. Sheriff Armando Fontoura said law enforcement has benefited from great advances in technology, but successful police work is still measured “by boots on the ground and today the officers are often accompanied by their four-legged friends.” The Sheriff noted that dogs from the Essex County Sheriff’s Office worked at Ground Zero as well as patrolled other neighborhoods in New York City in the aftermath searching for reported explosive devices. “Dogs can do an awful lot to keep us safe,” Fontoura added. “I want to thank County Executive DiVincenzo for remembering the rescue dogs for what they did after 9/11 and for what they do every day,” Newark Public Safety Director Anthony Ambrose said. “Search dogs covered 16 acres of land at Ground Zero covered with metal and debris, and went where humans could not go. This is a fitting way to remember how many families gained some sort of closure because of the work by dogs,” he added. “This is a great example of how we can pay homage to those who help us who are not human. I want to thank the County Executive for his vision and for having this statue created,” said Freeholder President Britnee Timberlake, who was accompanied by Freeholders Lebby Jones, Leonard Luciano and Patricia Sebold. The Essex County Eagle Rock September 11th Memorial was dedicated in October 2002, just over a year after the attacks. Its many elements pay tribute to the men and women, police officers, firefighters and other first responders who lost their lives at the World Trade Center, the Pentagon, in Pennsylvania and aboard the four airplanes that crashed that day. It was the only 9/11 memorial to list all 3,000 victims’ names until 2011 when the World Trade Center Memorial was dedicated. In 2009, the Essex County 9/11 Memorial was expanded to include a monument honoring the 33 flight crew members aboard the four airplanes that crashed. In 2011, a 7,400-pound steel and concrete artifact from the World Trade Center foundation was installed at the site and a bronze plaque was dedicated to honor emergency medical technicians who responded to Ground Zero and those who provided aid to people returning from New York across the Hudson River.